Ranked No. 207 on Rolling Stone's list of the greatest albums of all time! Abraxas remains the consummate Latin rock album. The confident sound of Santana stretching out and carving out a distinctive new genre, the 1970 set is daubed with psychedelic accents and Afro-Latin grooves. Abraxas immediately captured the public's ear, spending six weeks as the nation's No. 1 album and spawning the cosmic "Black Magic Woman" as a Top 5 single that's since become one of the most widely recognized songs in history. A confluence of celebratory vibes, bluesy jams, mellow vocals, and hip-shaking grooves, Abraxas is a cornerstone of any music collection. Picking up on the momentum of its excellent 1969 self-titled debut and drifting into more versatile territory, Santana reimagines what's possible in melding various disciplines and styles. Mysticism and spirituality abound amidst cohesive performances involving a vibrant mélange of purring organs, conga beats, and fluid bass lines. And that's to say nothing of the bandleader's extraordinary playing. Wild, free, and loose, the group conjures the feeling of mountains and rivers on the lead-off instrumental "Singing Winds, Crying Beasts," leads a salsa parade on the definitive version of Tito Puente's "Oye Como Va," and explores its sensual side on the stellar showcase "Samba Pa Ti," a tune indicative of the album's Latin vibes and percussion. Sonically, Abraxas takes advantage of studio techniques such as cross-fading and mixing lacking on its predecessor. 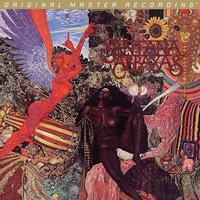 As stated in The Mojo Collection: "Dissatisfied with the sound of their debut, the group brought in as a co-producer veteran jazz engineer Fred Catero, whose skills proved invaluable in balancing the new range of musical flavors Santana (was) bringing into its sound: the result was a giant step on from (the band's) debut."